My, but Halloween does sneak up on us, doesn’t it? Every year you say, “I’m going to start planning my costume in August!” Then you blink and it’s October 29th. How does that even happen?! If you are looking for some last minute, easy Halloween costumes, we’ve got you covered. Along the same vein as the witch, throw on all red clothes and grab some horns and a pitchfork tail. Makeup can be as minimal or dramatic as you have time available. 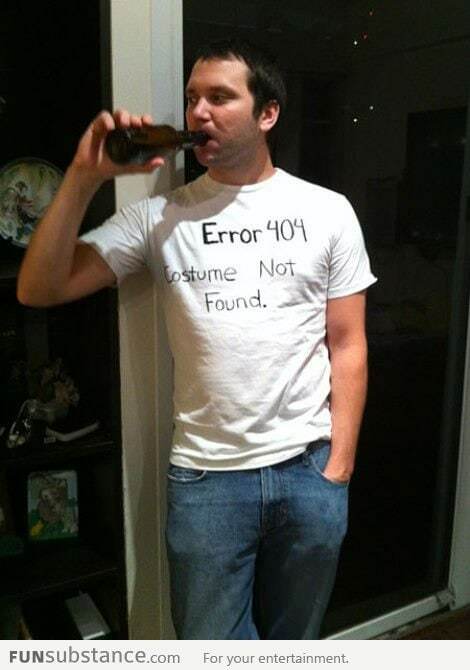 If you want people’s reaction to your costume to be met with inevitable groans, try a pun costume! – French Kiss – find a striped shirt and wear make-up of your favorite KISS band member. – Deviled egg – Instead of the all red of a regular devil, find a white shirt and attach a big yellow circle to the middle. You can use construction paper or anything you find handy! – Chick magnet – Dressed in all black, find chicks and attach them all over. Peeps work great for this! – Social Butterfly- Can’t put your phone down? Embrace it! Put images of your favorite social channels on your shirt and find some sweet butterfly wings. Search the hashtag #puncostumes for more inspiration on Instagram! No time to get a full costume? No sweat. How about creating some cool dramatic effects using only makeup? We carry the Mehron line of products at Everything Party. They have an amazing selection of great effect makeup. See this tutorial on how to create realistic scars. Of course, you can always swing by and grab one of our costumes in-house! We always carry a large selection and will make sure you have what you need to hit the town on Halloween!